Norwich, county town of Norfolk, lies on the little River Wensum within easy reach of the beautiful Norfolk Broads, which are fun to explore by boat. 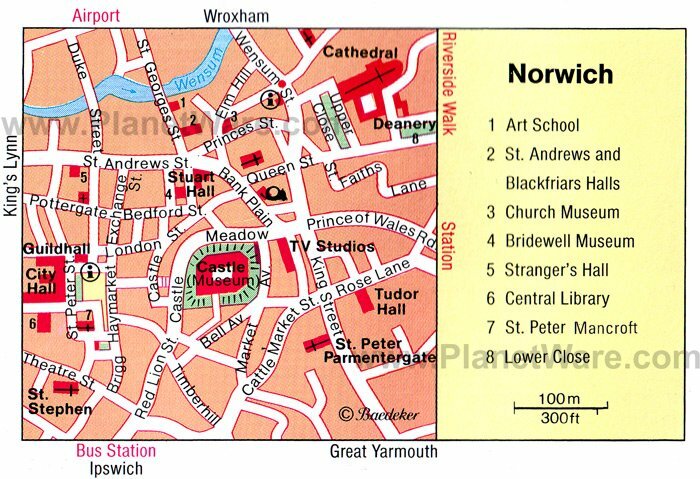 Norwich has more medieval churches (32 in all) than any other city in England except London. A bustling business and shopping center, Norwich is East Anglia's traditional capital, a fact reflected in its splendid Norman cathedral. Centuries of history can be found in its old gateways and winding lanes, and it's also a vibrant cultural hub offering many things to do, from browsing the lovely boutique shops to enjoying the famous two-week long Norfolk and Norwich Festival. This fun event takes place each May with musical and theatrical performances, as well as visual art exhibits. Gleaming white with a striking 315-foot spire (the highest in England after Salisbury and famous for its nesting peregrine falcons), Norwich Cathedral was built in 1096 and has preserved its Norman character better than any other church in the country. Highlights include the Monk's Door and the Prior's Door leading to the two-story cloisters, built between 1297 and 1425. 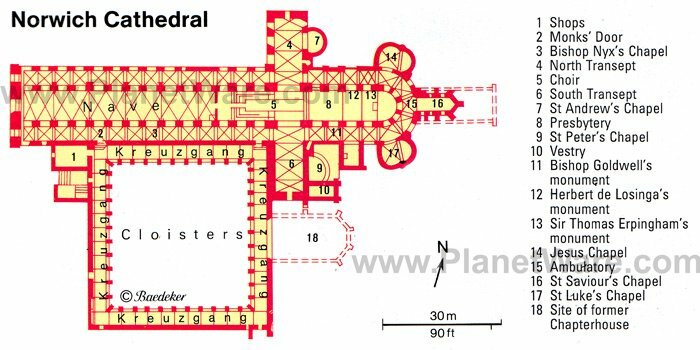 Also of interest is the nave, with its 14 bays, low massive columns, and fine lierne vaulting, as well as the impressive choir, with its 62 stalls, many splendid canopies, and beautifully carved misericords dating from 1420. There are also a number of interesting tombs, and behind the high altar is the old stone bishop's throne dating from the 6th century. Be sure to explore The Close, the area around the cathedral that is home to some 80 historic buildings, as well as the delightful Cathedral Quarters with its many fine shops and cafés. Along the way, you'll discover the delightful 15th-century Bishop's Palace and St. John's Chapel (1322), both now part of Norwich School. Other nearby churches worth visiting include St. Peter Mancroft, the city's largest after the cathedral, and the Roman Catholic Cathedral Church of St. John the Baptist. Once a Saxon marketplace, Tombland is a wonderful place to begin exploring old Norwich. From here two gates, St. Ethelbert's (1272) and Erpingham (1420), lead into the idyllic tranquility of the Cathedral Close, with its wealth of historic buildings, including the medieval deanery. It's also close to Elm Hill, a lovely medieval cobbled street near the River Wensum lined with tiny, old houses, many of them now attractive shops. Near the top end of Elm Hill are St. Andrew's and Blackfriars Halls, and just a short distance away in Bridewell Alley is the Bridewell Museum. Housed in a 700-year-old former "house of correction," highlights include exhibits devoted to industry and handicrafts in Norfolk as well as a display of silk shawls once prized by Queen Victoria. Be sure to also visit the neighboring Colman's Mustard Shop and Museum, introducing the 180-year history of one of England's most famous condiments. Built on a large artificial mound, Norwich Castle consists of a splendid Norman keep constructed in 1094 by William II that is now home to a superb museum and art gallery. Set out as a rotunda surrounded by various galleries containing extensive archaeological sections, the castle's interior also houses natural history dioramas, collections of medieval weapons, glassware, and ceramics. The painting collection includes English and Dutch masters of the 17th and 18th centuries, as well as examples from the famous Norwich School of painting. Just beneath the castle is the Royal Norfolk Regimental Museum, with its excellent collections of uniforms, medals, and paintings. A few minutes' walk from here is another must-see, the city's spacious Market Place, site of the Norwich Market, one of the most notable markets in the county. Nearby is the City Hall, Central Library, and the 15th-century Guildhall. Exploring the center of this delightful city will lead to the discovery of such gems as Strangers' Hall in Charing Cross, a medieval merchant's house now serving as a museum documenting domestic life from the Tudor period to the Victorian era through costumes and furniture. Suckling House, adjacent to St. Andrew's Church, is a handsome example of a medieval townhouse, and nearby St. Peter Hungate contains a display of religious arts and crafts. Another fine piece of medieval architecture is St. George Colegate, a church built in 1459 and practically unchanged since. Culture lovers will also want to linger a little longer in Norwich to enjoy some of the city's first-rate theater. Leading the pack is the recently renovated Theatre Royal, notable for hosting a variety of touring shows, and the Maddermarket Theatre, founded in 1921 and famous for its Elizabethan-style stage. Those traveling with kids should visit the Norwich Puppet Theatre, known for its many excellent educational programs. Dragon Hall, an outstanding Grade 1 listed medieval trading hall dating from 1430, is famous for its spectacular Great Hall featuring an impressive timber crown-post roof and intricately carved dragon. Built by merchant Robert Toppes as the heart of his international trading empire, it was once full of wool, cloth, timber, spices, pottery, and other items of trade. Amazingly, the whole structure was lost for centuries, concealed within a terrace of houses and shops. Tours of this delightful property, now fully restored, can be arranged through the Writers' Centre Norwich. The Norfolk Broads, an easy drive east of Norwich, comprise a fascinating nature reserve ideal for sailing and boating holidays. Occupying the triangle formed by Yarmouth, Wroxham, and Stalham, the area is traversed by the River Yare and its tributaries the Ant, Thurne, Bure, and Waveney - a total of 200 miles of waterways. Windmills such as the wooden Boardman's Mill at Ludham, the brick-built Thurne Dyke Windpump on the bank of the Thurne, and the 82-foot-high Sutton Mill were once used for drainage and call to mind similar scenery in the Netherlands. Nature lovers will find waterfowl, butterflies, dragonflies, and rare flowers, and anglers will be attracted by the large numbers of fish (bream, rudd, roach, perch, and pike). Of the region's many tourist attractions, families will want to include the wonderful BeWILDerwood on their itineraries. In the village of Horning, this fun adventure park encompasses a large area of woodland and numerous treehouses, zip lines, and rope bridges to tackle, along with a maze and special areas for toddlers to explore. The largest of the Norfolk Broads - and one of the most beautiful - is Hickling Broad, where you'll find the nearby old (and recently restored) Horsey Windpump, one of the region's most impressive windmills. The best starting point for an exploration of the area is Potter Heigham, going upstream on the River Thurne to Martham Broad, Horsey Mere, and Hickling Broad. Downstream leads to the River Bure. From here, it's possible to explore the southeast by way of Breydon Water and the River Waveney to Oulton Broad outside Lowestoft, or westwards through Wroxham Broad. Other good centers from which to explore Hickling Broad are Ranworth and South Walsham, small picturesque villages with interesting churches. The beauty of the Broads can best be appreciated from the water, and while sailboats and motor cruisers can be rented, numerous boat tours are also available. The delightful Bressingham Steam Museum is home to a unique collection of vintage steam locomotives and traction engines, as well as the five-acre Dell Garden. Locomotives running the five miles of track include the Royal Scot, which toured the USA and Canada, and Oliver Cromwell, the last British Rail steam locomotive in passenger use. Also on site is a museum of railway memorabilia, an extensive fire engine collection and a Victorian steam carousel with a steam-driven organ. Bressingham is also home of the Dad's Army Appreciation Society and its recreation of fictional Walmington-on-Sea from the hit TV show Dad's Army. The nearby village is also worth exploring, in particular the 14th-century St. Mary The Virgin Church. Steam enthusiasts will also want to visit Strumpshaw Hall Steam Museum. This excellent museum is home to one of the country's largest collections of traction engines and vintage steamrollers (some 50 or more all told), many of which are still put through their paces at regular demonstrations and steam-themed events. Also fun for kids is a collection of vintage fairground rides, including a merry-go-round and a narrow gauge railway. Part of the University of East Anglia, the Sainsbury Centre for Visual Arts should be included on any Norwich itinerary. Highlights of this impressive modern structure include its displays of modern art by the likes of Picasso, Giacometti, and Henry Moore. It also boasts a large collection of primitive art from across the globe and hosts numerous visiting exhibits and education programs throughout the year. After your visit, stroll along Riverside Walk on the River Wensum to the Cow Tower, part of the city's original medieval fortifications. Nearby Bishop Bridge (1395) is one of the oldest bridges in the country. Featured at this site is a display covering the history of the Royal Observer Corps, as well as a rare nosepiece of a Felixstowe F5 flying boat discovered in a garden after 60 years of use as a potting shed. Aviation fans will also want to visit the City of Norwich Aviation Museum in Horsham St. Faith, with its displays of aircraft such as the Vulcan, Dart Herald, and Vampire. Exhibits include memorabilia from the 8th Army Air Force stationed here in WWII. Maids Head Hotel: 4-star historic hotel, Cathedral Quarter location, four-poster beds, excellent breakfast. Holiday Inn Norwich City: 3-star hotel, beside football stadium, on-site restaurant, mini-gym. Best Western Annesley House Hotel: mid-range pricing, Georgian houses, conservatory dining room, garden with koi pond. Premier Inn Norwich Nelson City Centre Hotel: budget hotel, overlooking the river, clean rooms, comfortable beds.